88. 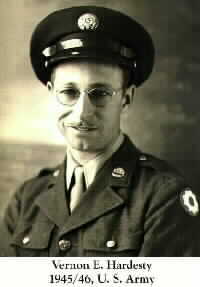 Vernon Edward4 Hardesty (Homer James3, John Coleman2, James1) was born in Royal, Antelope, Nebraska 18 February 1915. (1) Vern died 05 September 1997 in Casper, Natrona co., WY, at 82 years of age. His body was interred 9 Sep 1997 Douglas Park cemetery in Douglas, Converse Co., WY,. He married twice. He married Ruth Pearl Stebbins in Oakland, Burt Co., NE, 11 September 1941. Ruth was born in Scottsbluff, Scottsbluff co., NE 11 September 1923. Ruth was the daughter of Lyle Harley Stebbins and Grace Louise Andersen. Ruth died 01 December 1990 in Las Vegas, Clark Co., NV, at 67 years of age. He married Ruth Ellamae Rice in Cheyenne, Laramie co., WY, 26 June 1965. + 175 i. Judith Ann5 Hardesty (still alive). + 176 ii. Linda Lee Hardesty (still alive). + 177 iii. Richard Lee Hardesty (still alive).